From Initial site investigation we can provide project management and oversight to better manage building performance and efficiency. We will prepare all required documentation of our energy analysis to help identify potential costly expenditures. 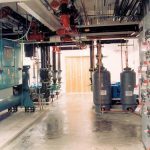 Existing buildings equipment and systems can be improved to better function together. Our initial site investigation will lead the way to analyze energy use and systems. Our project management and oversight will also included all required documentation throughout the process.